Tonight’s show starts off with the introduction of the two remaining Idol contestants- Scotty McCreery and Lauren Alaina. Ryan refers to the match up as the “boy next door” versus the “Southern belle” and informs us they both love country music, both are merely teenagers, and both want to win this season’s American Idol. Ryan addresses rumors that were swirling around right before the show began regarding Lauren's lack of a voice in rehearsals. One rumor was that Haley Reinhart was prepping to take Lauren's place in tonight’s finale, just in case. Ryan called out the show’s doctor who told us that she essentially sprained a vocal chord and is hopped up on tons of drugs and will be fine. Ryan dramatically asks “will she be able to make it the entire show?” Apparently this doctor is also a psychic because he said she’ll make it without a doubt. Contestants are going to sing three songs- their favorite of the season, a song picked by their idol, and then their future single should they be crowned winner tomorrow night. Scotty won the coin toss last week and in a brainless, yet gentlemanly move, deferred to Lauren and she wisely decided to go second. Scotty started us off with "Gone" by Montgomery Gentry and he did it better than earlier in the season...he started off down the aisle in the audience and was over animated but did his darndest to fill up the Nokia Theater, his vocals suffered as a result...but, he was a good time. He had the girls up front going nuts and was very playful and interactive with the audience. Lauren sings Carrie Underwood's "Flat On The Floor." She, too, sang it better than earlier in the season and had an amazing moment in the middle. She was rockin' it out a little, I loved it. Cameras pan to judges getting into it, lots of Lauren signs and tonight is feeling very skewed in Lauren's favor (a Dr. in scrubs came out on the stage to "clear" her to perform for God's sake). Her performance was one of her best but like Scotty, her vocals suffered as a result. In that round I'd call it a draw and neither teen seemed to be swallowed up by the enormity of the Nokia Theater which is major considering their age and virtual inexperience. George Strait picks his own song; "Check Yes Or No" for Scotty which is a flirty, love note song between elementary age kids, very appropriate for Scotty's age, range, and delivery. It was low energy but solid. He was again very interactive with the audience and handled himself as if he was headlining his own show. Lauren's idol is Carrie Underwood and she picks "Maybe It Was Memphis" by Pam Tillis for Lauren. I love this song, it’s big, sultry, and well-written. Lauren rushed through it and was too breathy in the wrong parts and appropriately breathy in the right parts as well. I do love that they both got '90s country songs, I also loved that Lauren rose to the occasion and acted like a bit of a star...more so than she has so far this season. Her vocals seemed stretched and she's limited range-wise as it is so it wasn’t very good compared to the original but, it was good for Lauren. Randy gives round one to Scotty...slightly. Round two to Lauren…slightly...JLo agrees and Steven gives both rounds to Lauren "because she's prettier than you are." Way to keep it serious and professional, Stevie. Taio Cruz comes out next and sings some nonsense I guess the fans helped write over the course of the season. Next we get their final performances of the night and Jimmy Iovine is giddy over the pick for Scotty's first single called "I Love You This Big." As he sings, a jumbotron behind him shows his journey thus far and I realize he didn't shave his head! His song is cute but again it’s low energy. I wanted low, low notes for the finale and got one. It’s a sweet, country love song that sounds like every other sweet, country love song out there. The judges look underwhelmed; Randy said the song may not have been the best song for him but vocally it was great. JLo said he sold the song and told the story of a song we'd never even heard before, Steven babbled something ridiculous then smiled great big. It felt like they already felt he’d lost the competition. Lauren gets a more personal song called "Like My Mother Does." It’s totally emotional and touching, she even walked down and loved on her momma as she sang to her. Her mom was lifting up a praise hand to the Heavens like she was in church which activated my gag reflex, to be honest with you. They handed Lauren a moment and the competition and a bedazzled, gold plated platter. Everyone's bawling, Randy said Jimmy did her right and he gushed all over the place over her and gave her a standing O. JLo said it was a tight race but with that song she may have just won. Steven says Lauren is his American Idol. No one said that crap to Scotty...which could get his girl fans all hot and bothered and texting their thumbs to the bone, you never know-American Idol is a tricky, monstrous, well-oiled machine. Nothing is chance or accident around there. JLo said Scotty's been her front runner the whole time, and won't pick a winner for this round, Randy said slight edge to Lauren and Steven said no doubt...Lauren, hands down. Scotty was agreeing and patting Lauren and grinning great big for her and telling her nice things that made her shake her head "no"; I'm thinking he told her she was great and just won. To close out the show we get David Cook doing "Don't You Forget About Me" as an ode to all of this season's finalists. I don't like him, his voice, his style-none of it; but, he was the best performance of the night. The age, maturity and experience gap has never seemed bigger. It’s tough to call how this will go down for the country teens but, I will say while Lauren out-performed Scotty (as I knew she would), Scotty looked the most confident and like he was headlining his own show and Lauren acted like she was performing on a music competition show. 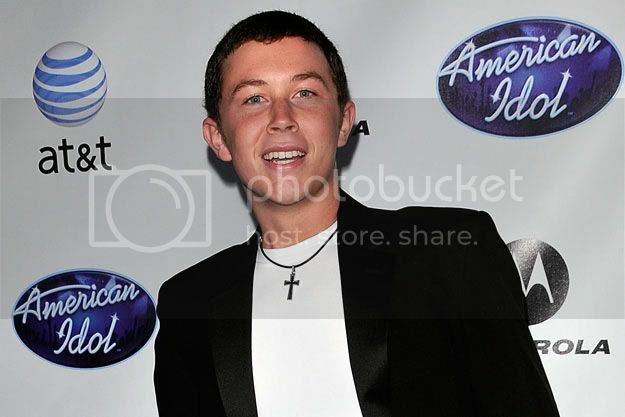 I’m hoping Scotty is the winner but as we all say every year: it doesn’t matter who wins, they will both do fine.